Hyôhô Niten Ichi Ryu a été créée au début du 17ème siècle par MIYAMOTO Musashi. La célébrité de cette école tient à la stature de son fondateur dans l’histoire martiale, artistique et philosophique du Japon, à ses 60 combats dont il serait sorti invaincu ainsi qu’à la rareté de sa « technique des deux sabres », nito. Mobile : 00 33 (0)6 61 25 71 64 Hyôhô Niten Ichi Ryu was created at the beginning of the 17th century by MIYAMOTO Musashi. 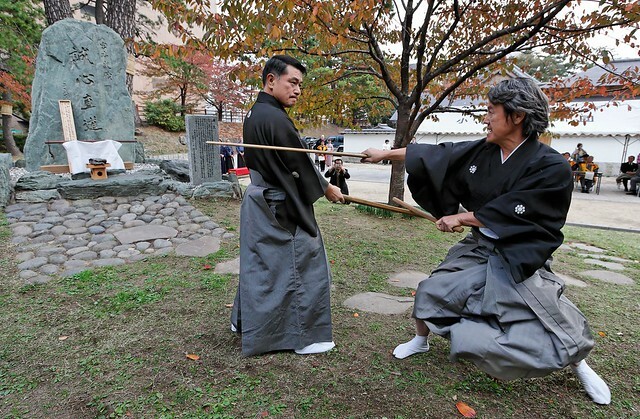 The fame of this school comes from the stature of its founder within the martial, artistic and philosophic history of Japan, as much as from his 60 fights without defeat and the rarity of its “two swords technique,” nito. “ Hyoho Niten Ichi Ryu is open to anyone and we have never refused anyone. Musashi’s t eachings are for the entire world. ” Iwami Toshio Harukatsu soke, published in DRAGON French martial arts magazine, January/February 2005.